Cincinnati: Editor Tom Callinan is talking to Enquirer editors about “possible scenarios” as Friday’s deadline for 50 companywide buyout applications draws closer. “But we really won’t know what the future will hold until we see who is on the final list on Friday,” local blogger Newsache quotes Callinan telling staff. Indianapolis: Seven newsroom employees were laid off, according to Indiana blogger Ruth Holladay. They were notified by top editor Dennis Ryerson, “in person or through a telephone call,” Holladay says. They were among a reported 20 — down from an initial 23 — cut loose from the 1,440-employee paper, readers here say. Phoenix: Two reports that 35 workers are being laid off from The Arizona Republic‘s pressroom. “The other ‘common workers’ are getting thrown out without a buyout!” one reader says. “Shame on the Republic management! !” Like the Enquirer, the Republic has delayed any layoffs, pending responses to a buyout offer. I still don’t know how many offers are on the table, however. Plus, were the buyouts only for certain employees — such as those in the newsroom? Why wouldn’t pressroom employees be eligible, too? On Wall Street: What’s next for Gannett shares? We brace ourselves for the 9:30 opening of stock markets this morning — a day after GCI plunged 4.6%, erasing what little was left of the layoff bump. Post latest developments about your paper, plus publishers’ memos, other tips, in the comments section, below. To e-mail confidentially, write gannettblog[at]gmail[dot-com]; see Tipsters Anonymous Policy in the green sidebar, upper right. Racing to shore up unprecedented losses in revenue and profits, Gannett is now quietly engaged in an aggressive new round of budget cuts that could wipe out as many as 2,300 jobs, or 5% of the company’s workforce. The latest cuts were revealed today, when the Springfield News-Leader reported that GCI is consolidating finance and accounting for 67 of its newspapers and TV stations — moving the work to two new service centers at company locations in Indianapolis and Springfield, Mo. The shift will wipe out a net 167 jobs, the paper says — with the possibility of more consolidation to come. “Gannett may move other services at its more than 100 newspaper and broadcasting sites to the Springfield and Indianapolis service centers,” the story says. Gannett hasn’t disclosed details of the new budget cuts, including any final target. The consolidations at Indianapolis and Springfield follow similar shifts involving customer service, photo-toning, TV station graphics, advertising art production, and copyediting work. The company’s silence has created even more uncertainty for the company’s approximately 46,000 employees. Rumors swirled last week that the company planned to ax perhaps 1% of payroll, based on June levels. But recent buyouts and layoffs in Cincinnati; Jackson, Miss. ; Detroit; Fort Myers, Fla., and Honolulu, have been in the range of 5% of their workforces. If that higher figure were applied across Gannett, combined job cuts would be close to 2,300. Budget cuts at your Gannett workplace? Please post details in the comments section, below. To e-mail confidentially, write gannettblog[at]gmail[dot-com]; see Tipsters Anonymous Policy in the green sidebar, upper right. The purported Steele commentary criticized pending federal legislation that would reduce credit card fees and suggested that retailers stand to profit from it, Birnbaum says. Birnbaum says editors declined to comment at the Advertiser and at the second paper, the Tuscaloosa News. Montgomery Publisher Brown is history; what’s up? Got details on the latest executive shuffle? Leave a note in the comments section, below. To e-mail confidentially, use this link from a non-work computer; see Tipsters Anonymous Policy in the green sidebar, upper right. Related: In Montgomery, watchdog reporting on a budget, and Calling Louisville: What’s the story on Roegner? I sometimes read remarks by Gannett executives, then wonder: Are we on the same planet? Check out retiring newspaper division Chair Sue Clark-Johnson‘s speech on April 15, when she left the chairmanship of the Newspaper Association of America trade group. Fine. But what has Clark-Johnson done in the past year to bolster watchdog work at Gannett newspapers and TV stations? Why is she content to allow, for example, the Montgomery Advertiser to scrape by without a legislative reporter for months at a time? How are journalists to comfort the afflicted and afflict the comfortable when they don’t have working photocopiers? “We are restricted only by our creativity and will to embrace change,” Clark-Johnson said in her speech. Well, no: Gannett is restricted by the failure of leadership to understand that its strategic plan is failing — that more of the same won’t cut it. Advice to applicants: Don’t bet the summer rent on your internship if you wind up at a paper like the Montgomery Advertiser. Last June, the Alabama paper was forced to make quick budget cuts, leaving three interns suddenly jobless. In this new feature, I’m occasionally spotlighting Gannett newspaper front pages in print, drawn randomly from the Newseum‘s collection. This is today’s Montgomery Advertiser, which is very heavy on graphics; click on the image for a bigger view. Basically, it’s a one-story front built around “The Wars They Fought” package. I like it! It took me a long time to come around to this, but I like front pages with big visuals pointing to good stuff inside. 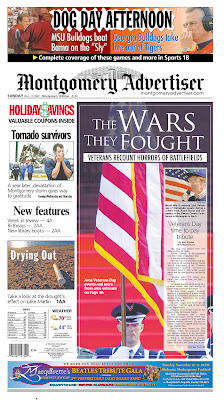 A question for you: How often does your newspaper have a one-story front? E-mail Gannett Blog, or comment below. The Montgomery Advertiser was forced to make quick budget cuts last week, Journal-isms said today, leaving three interns suddenly without summer jobs. Similar cuts could be coming at other Gannett properties, the site says. “I would not have done this if I had any other choice,” Editor Wanda Lloyd told Journal-isms. She said publisher Scott Brown told her recently the paper would be asked to consider possible cuts for the rest of this year. “The money for the three interns was not in the budget,” Lloyd said. In order to meet new budget targets, Lloyd said, she might have had to cut a full-time staff member. The good news: The displaced interns were hired by Schurz Communications, a South Bend, Ind., chain of 15 dailies and five weeklies. The bad news: A bigger cost may yet outweigh any of Montgomery’s savings. I’m talking about the negative publicity that followed, especially in the wake of CEO Craig Dubow‘s well-publicized bid to boost talent development. Here’s one blogger’s reaction, linked to from heavily trafficked Romenesko‘s blog: “Intern Injustice: Gannett Gives The Middle Finger To Three Ala. Interns.” Ouch! You are currently browsing the archives for the Montgomery category.